Four inputs, can handle audio and CV. Precision components for pitch accuracy. 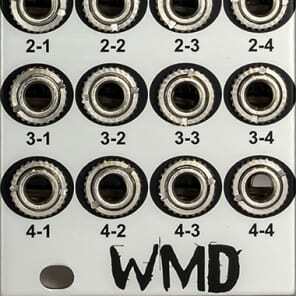 The four inputs (rows) are routed with the buttons to output columns. If multiple inputs are selected simultaneously for an output, they are mixed together at unity gain. 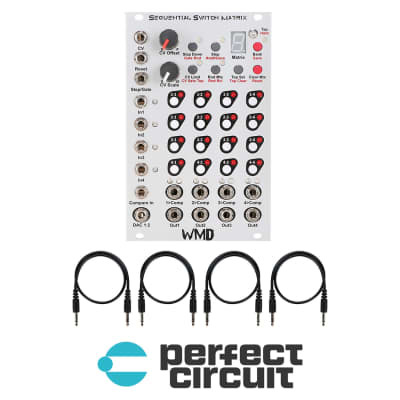 A comparator input is available and each output mix is compared to the signal on the jack. This jack has a 0.5 volt normal. The LEDs by the buttons indicate that a connection is made. That's all well and good. The fun part is that each input to output routing matrix is then stored in an array. You can have 16 matrices in each bank. There are four banks available. The current matrix is shown on the 7 segment display. The matrix counter can be advanced with a gate signal. Reset with a gate signal. 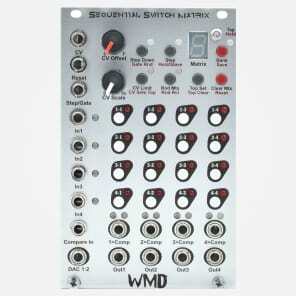 The matrix counter can be offset with CV and an offset knob. The seven buttons near the top provide additional modes and settings. Red lettering indicates push and hold (1.5 seconds) functionality. The bank button changes bank with a tap. Saves all matrices and settings with a hold. The save takes about 1.5 seconds. All settings are recalled on power up, but must be saved before power down. This allows you to just save changes you want, and recall patches while retaining the ability to make changes. TopSet/TopClear - sets the upper matrix in the count for gate step inputs. Hold to clear the limit and allow the matrix to count to 16 (F). LED indicates that the top is set. Decimal point on the 7 segment display will light when the top matrix is selected. Reset/ClearMatrix - tap to reset the counter to 0. Hold to clear all routing in the selected matrix. Rnd/RndRcl - tap to randomize the selected matrix. Hold to set the selected matrix to always randomize upon being selected (via CV or gate). CV Limit to Top - tap to enable and light the LED. When enabled, the CV input and offset will be constrained to the upper matrix. When disabled and a top matrix is set, the CV/Offset will offset the matrix counter. For example, if the top is 3, a gate will count from 0 to 3 and reset. Disabling "CV Limit to Top" will cause CV to offset the start of the count (if offset by 8, then the count will start at 8 and go to 11 (B)). If enabled, the top will always be 3, and the CV can be used to set the starting (lowest) matrix. Step/Hold - Tap to step the matrix counter. Push and hold to disable CV, gate and reset signals from altering the matrix counter. Gate Mode - Tap to change the gate modes. Available modes are step up (LED off), Step Down (LED Green), Random (LED Red). There will be a video version available using LM6172 opamps. Video version will adhere to the LZX specifications. The inputs and outputs will operate at video rates. Routing control will not. Upper frequency of the routing control is TBD, but will run at audio rates. The DAC 1:2 output is a voltage output (0-5 volts) of the 8 bit combination of the first two columns. This allows the first two channels' routing information (lit LEDs) to be used as a voltage output. 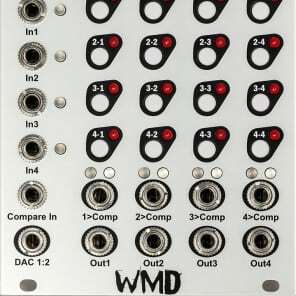 (16 step voltage sequencer). This is always operational. Bi-color LEDs show the amplitude and polarity of input and output signals. Comparator LEDs will be lit when the output is on.